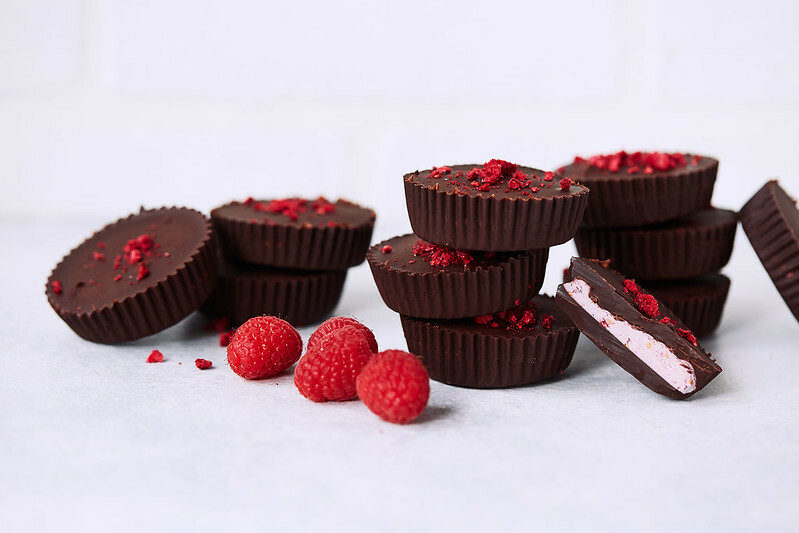 These 5-ingredient Dark Chocolate Raspberry Coconut Butter Keto Cups are a tasty snack or the perfect bite-sized dessert. My favorite part, for as fancy as they appear, they are ready in no time at all. Besides being low carb and keto are also paleo, gluten-free and vegan, too! You guys know I am not much of a sweets person. It’s just not really my thing. It’s rare I am dreaming up new and clever ways to recreate treats to be more healthful, because for me, as long as I have a bar of super dark chocolate in the fridge, freezer and/or pantry (what can I say, I like my chocolate at different temps for different reasons) – I am a happy lady. I’ve especially found since I’ve been eating keto for the last year +, my taste for sweets has basically diminished completely. But my love for chocolate will never waiver. 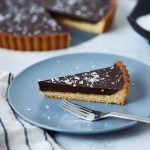 You’ll often find me slathering my dark chocolate squares in a little nut butter or coconut butter or I’ll spread some softened ghee or grass-fed salted butter on top, it’s truly my favorite treat. One square (ok sometimes it’s 2 or 3) every day and I am a happy lady. It helps knowing that dark chocolate is loaded with healthful benefits and when I am choosing fair-trade, organic super dark chocolate or making my own, there is no junk or additives, it’s low in sugar. It’s just real, whole food. 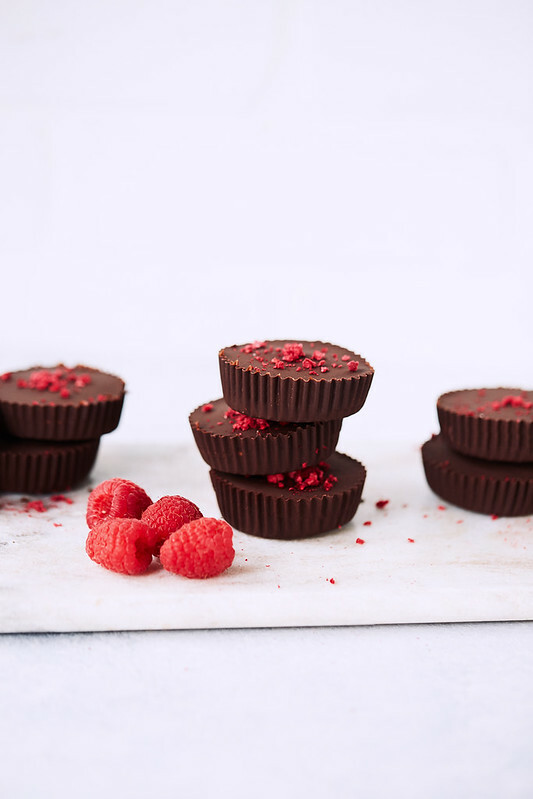 These 5-ingredient Dark Chocolate Raspberry Coconut Butter Keto Cups are a slightly more elegant and refined version of this obsession, just in time for Valentine’s day. A bit of sweet, delicate color and flavor from the raspberries takes these up a notch. 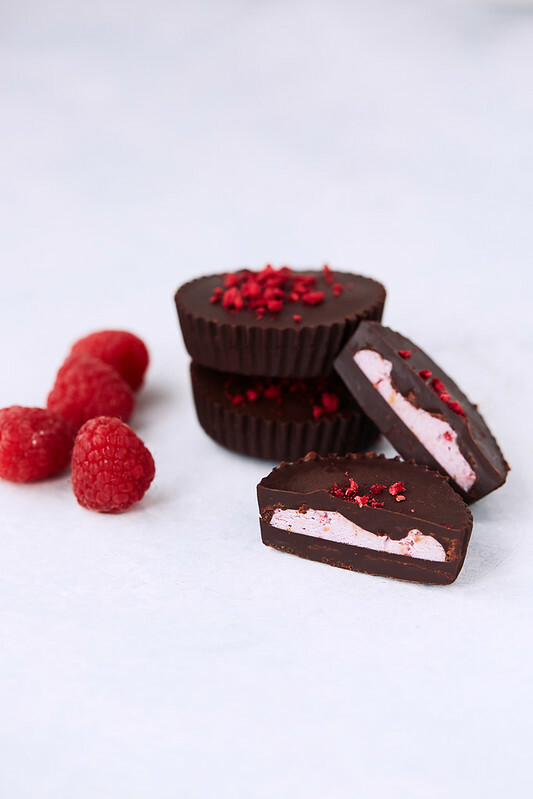 The raspberry flavor is subtle in the filling and if you opt for the freeze-dried raspberries on top, it’s a really nice finishing move. I don’t obsessively count macros, at all, but on a quick count, using 85% store-bought dark chocolate (sweetened with organic cane sugar), and without any added sugar in the filling or any toppings, each dark chocolate raspberry coconut butter keto cup contains approx. between 5 and 7 net carbs. This number will vary based on the chocolate you use, if you add any sweeteners that contains carbs, etc. Using stevia sweetened chocolate, darker chocolate or unsweetened, this number can be even lower. That’s for you to figure out, as you see fit. 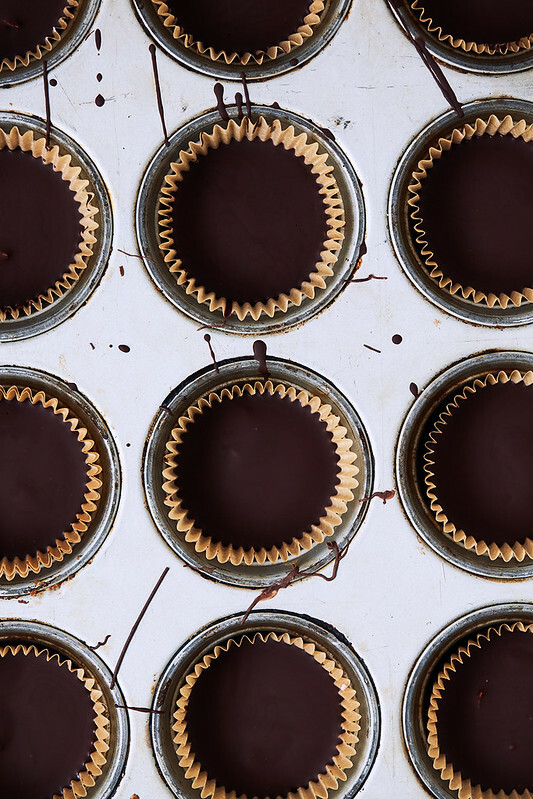 You can use 85 – 100% dark chocolate, homemade or store-bought. When making dark chocolate at home, you can easily control the level of sweetness and the type of sweetener you prefer. 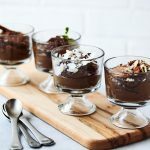 You can also use unsweetened/sugar-free dark chocolate or alternatively sweetened dark chocolate (I include links in the recipe notes), you can also just use your favorite milk chocolate, it’s whatever you want. Use strawberries, cherries, blueberries or blackberries instead of the raspberries. Or use no berries. Sweeten the coconut butter center and the chocolate to your preference, or don’t. Admittedly I love me a good organic 95 – 100% dark chocolate with the unsweetened raspberry coconut butter filling. I’m weird. Sometimes I add a couple drops of stevia. You gotta do you! You can use homemade coconut butter or store bought, but it’s best to work with it when it’s softened. 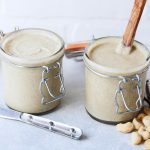 If your coconut butter is pretty hard, place your tightly-closed jar into a bowl of hot water and it’ll soften right up. 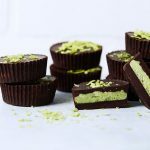 You wanna boost your keto cups? Try adding some MCT oil, MCT oil powder or collagen peptides to the filling, or anything else you are into. 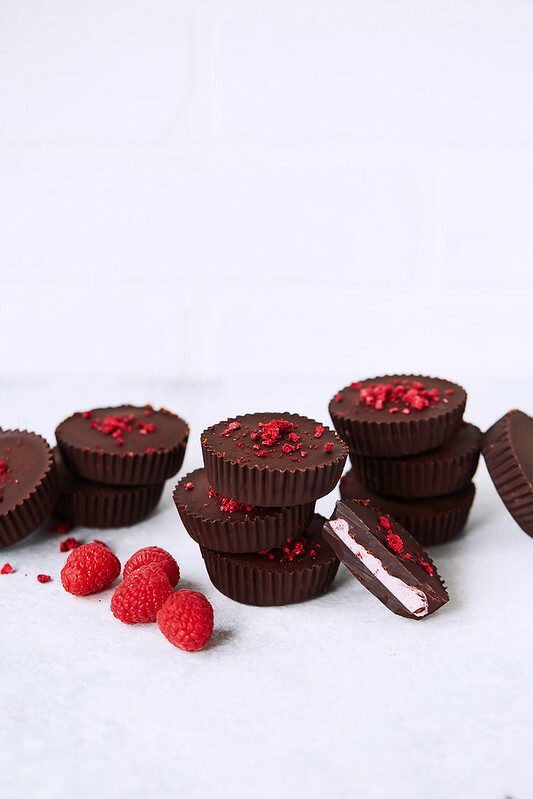 I like to top these Dark Chocolate Raspberry Coconut Butter Keto cups with a baby sprinkle of crushed unsweetened freeze-dried raspberries. It’s pretty and they have just the slightest tartness to them, which I like. You can also use shredded coconut or flaked sea salt. Or nothing. If coconut butter is not your thing – drop in your favorite nut butter, if you add the raspberries to that, holy crap, it’ll be like a PB&J filling. OK I’ll stop now. Line a 12-cup full-sized muffin tin with parchment or silicon muffin cups. You can also just use silicon muffin molds on their own. Roughly chop the chocolate if it's a bar. If it's chips, leave as is. Immediately remove the pan from the heat. Add one tablespoon of the melted chocolate to each of the lined muffin cups. Using a small spoon push the chocolate about ⅓ of the way up the sides. Place the muffin tin into the freezer for 10 minutes. Meanwhile make the raspberry coconut butter filling. Place softened coconut butter, raspberries, and coconut milk in the bowl of a mini food processor or work with a hand blender. Pulse until combined or mix by hand until well combined. Remove the pan from the freezer. 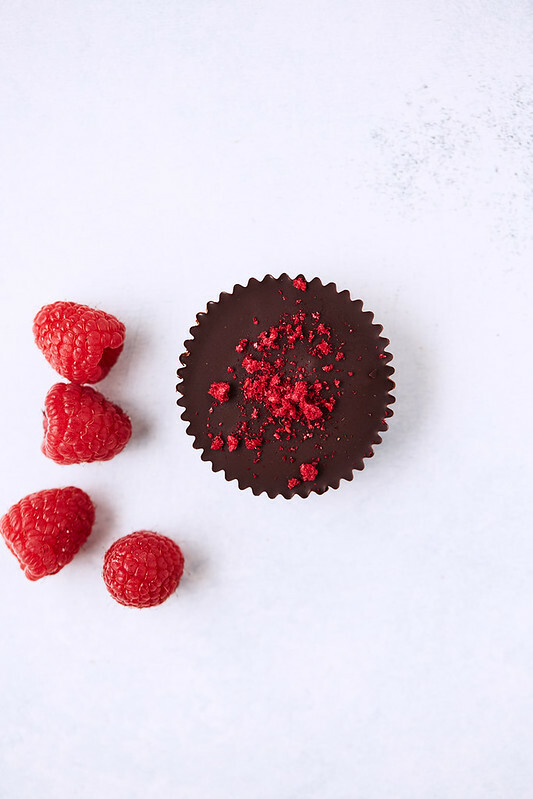 Place 2 teaspoons of raspberry coconut butter mixture in the center of each chocolate cup, using a spoon spread to flatten slightly immediately (it will begin to harden on the frozen chocolate). Repeat with remaining cups. Return to the freezer for 5 minutes. Reheat remaining dark chocolate if it has started to harden at all. 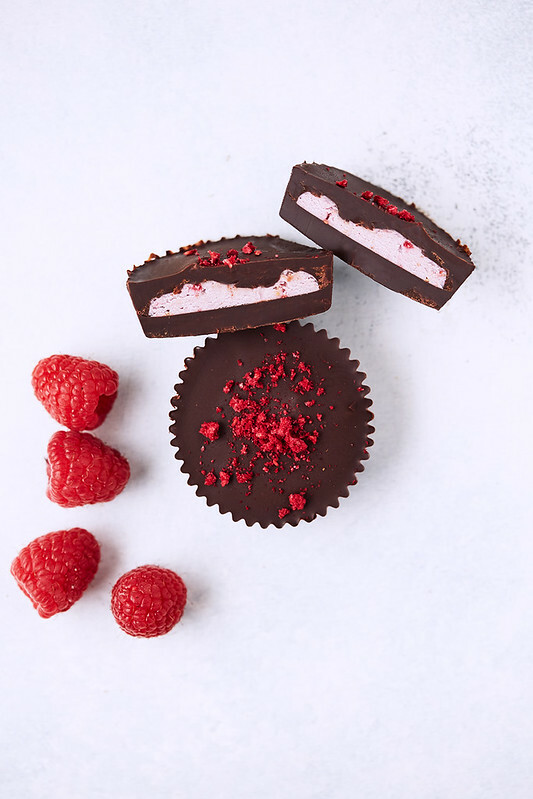 Add 1 tablespoon of melted dark chocolate over the top of each cup to cover the raspberry coconut butter layer completely, then return the pan to the freezer for 20 minutes to set. Eat straight from the freezer or store in the refrigerator. Top with a sprinkle of crushed freeze-dried raspberries, flaked sea salt or shredded coconut. • You can make your own dark chocolate and control the type of sweetener and your preferred level of sweetness. • You can also use your favorite dark chocolate bar or sugar-free chocolate or chocolate chips. Lily's makes stevia sweetened chocolate chips (they do contain soy), if you cannot have soy PASCHA makes allergy-friendly 85% bars and 85% and 100% dark chocolate chips, that you can sweeten however you'd like. • you can also make 24 smaller mini cups, if you want, using a mini-muffin tin. • I either use homemade chocolate or I really like this 85% organic dark chocolate or this one. Do you think you can do this without a food processor or hand blender? 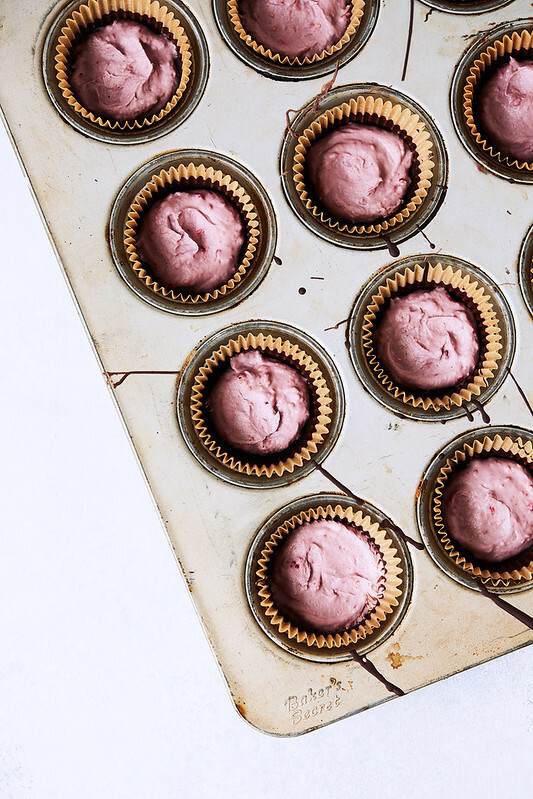 make the raspberry coconut butter filling. Place softened coconut butter, raspberries, and coconut milk in the bowl of a mini food processor or work with a hand blender. Pulse until combined or mix by hand until well combined. If your coconut butter is softened you should be able to make it with a fork. I make a coffee version with a fork in a measuring cup.